Christmas is a wonderful time of the year for Christians around the world; a time when we celebrate the birth of Jesus Christ. But it can also bring stress, distractions and a blow to our finances, especially when it comes to giving gifts. Why not try a few of the alternative gift-giving ideas and spread some good cheer along with Christian values all at the same time. These ideas come from Pat O., a member of the outreach committee. Trying to explain to a young child that you just gave the money you would have spent on their gift to a worthy cause, can be a hard sell. We use the following organizations which send a token gift to give to the child. Older children appreciate them too. World Wildlife Federation (www.wwf.org) Adopt an animal on the endangered species list. You will get a plush animal and adoption papers. National Wildlife Federation (www.nwf.org) Adopt an animal program at the national level. Other gift ideas available. Heifer International (www.heifer.org) Choose a meaningful gift to help families around the world receive training and animal gifts that help them become self-reliant. Heifer does sell stuffed animals, but hard to find on their website. May have to buy matching animal elsewhere. Our children’s Sunday School offer goes to Heifer. Ten Thousand Villages sells fair trade handmade goods from around the world. Princeton Shopping Center. UNICEF (www.unicef.org) catalog of gifts, cards. Church World Service (cwsglobal.org) Donations in honor of recipients for School Kits, Baby Care Kits, literacy classes, animals, wells, and much more. Cards can be printed out to give to the person. Womanspace (www.womanspace.org) See “December Holiday Wish List” 2012 on website. 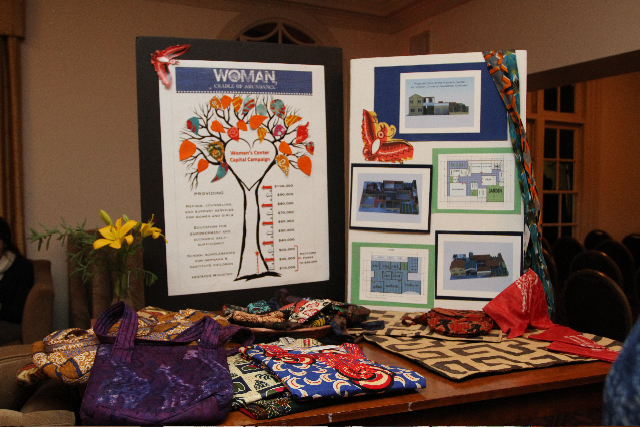 Woman, Cradle of Abundance (www.womancredleofabundance.org) Purchase items made by Women in the Democratic Republic (displayed in the photo above) of the Congo like clothing, table cloths and napkins, purses, jewelry. Donations also accepted for building a new facility to grow their business. 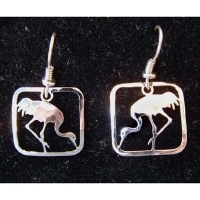 International Crane Foundation (www.savingcranes.org) has various crane-themed gifts, like the $25 earrings at left. This is part 1 of three posts distributed by the Outreach Committee. Here is a link to part 2, and you can pick up the complete sheet in the Sanford Davis Room! This entry was posted in Community, Lifestyles, Missions, UFAR and tagged Heifer International., UFAR, Women Cradle of Abundance. Bookmark the permalink.